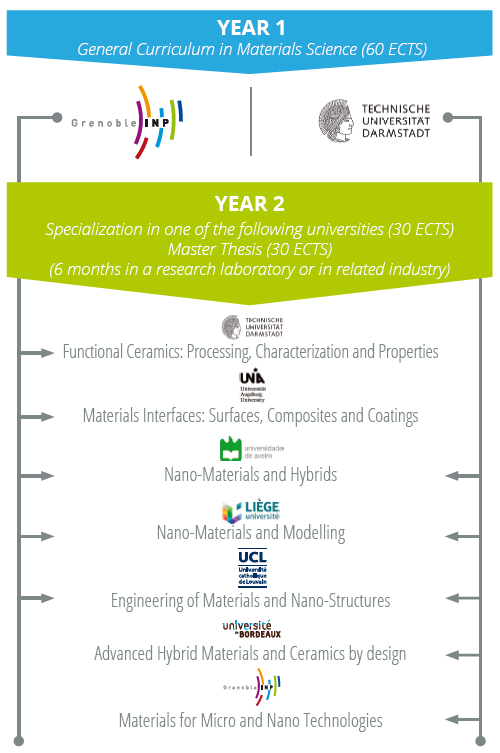 The first two semesters deals with general topics about materials science. The third semester is dedicated to a specialization provided by one of the partner universities as world-leading expert; it is made of mandatory and elective courses. The last semester is dedicated to the master thesis and is spend in one of the laboratories of the FAME+ Consortium. *ECTS (European Credit Transfer System): Created by the European Community to facilitate students’ mobility across Europe by a mutual recognition of their education unit values. To obtain a Master of Science degree, 120 ECTS are necessary (i.e. 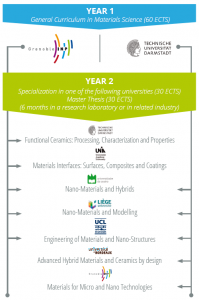 30 ECTS per semester).